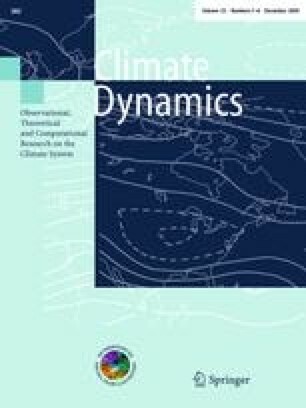 Simulations performed with the climate model LOVECLIM, aided with a simple data assimilation technique that forces a close matching of simulated and observed surface temperature variations, are able to reasonably reproduce the observed changes in the lower atmosphere, sea ice and ocean during the second half of the twentieth century. Although the simulated ice area slightly increases over the period 1980–2000, in agreement with observations, it decreases by 0.5 × 106 km2 between early 1960s and early 1980s. No direct and reliable sea ice observations are available to firmly confirm this simulated decrease, but it is consistent with the data used to constrain model evolution as well as with additional independent data in both the atmosphere and the ocean. The simulated reduction of the ice area between the early 1960s and early 1980s is similar to the one simulated over that period as a response to the increase in greenhouse gas concentrations in the atmosphere while the increase in ice area over the last decades of the twentieth century is likely due to changes in atmospheric circulation. However, the exact contribution of external forcing and internal variability in the recent changes cannot be precisely estimated from our results. Our simulations also reproduce the observed oceanic subsurface warming north of the continental shelf of the Ross Sea and the salinity decrease on the Ross Sea continental shelf. Parts of those changes are likely related to the response of the system to the external forcing. Modifications in the wind pattern, influencing the ice production/melting rates, also play a role in the simulated surface salinity decrease. H. Goosse is Research Associate with the Fonds National de la Recherche Scientifique (FNRS-Belgium). This work is supported by the FNRS and by the Belgian Federal Science Policy Office, Research Program on Science for a Sustainable Development. We would like to thank Marie-France Loutre for her help in the experimental design and Martin Vancoppenolle for a careful reading of the manuscript. We acknowledge the international modelling groups for providing their data for analysis, the Program for Climate Model Diagnosis and Intercomparison (PCMDI) for collecting and archiving the model data, the JSC/CLIVAR Working Group on Coupled Modelling (WGCM) and their Coupled Model Intercomparison Project (CMIP) and Climate Simulation Panel for organising the model data analysis activity, and the IPCC WG1 TSU for technical support. The IPCC Data Archive at Lawrence Livermore National Laboratory is supported by the Office of Science, US Department of Energy. This work was initiated during the CLIVAR/CliC/SCAR Southern Ocean Region Implementation Panel meeting held in Buenos Aires, 14–17 November 2006.